Feb. 22, 2013: Berry Petroleum Co.'s Placerita oil field, west of Sierra Highway between Placerita Canyon Road on the south and Golden Valley Road on the north. Berry Petroleum Co. shareholders voted Monday to accept a buyout offer with an estimated value of $4.9 billion from Houston-based LINN Energy and LinnCo, which becomes the 12th largest U.S. oil and gas company with the merger. LINN and LinnCo shareholders also voted &yes& Monday. Berry Petroleum will continue to operate as a wholly owned subsidiary of LINN. Berry Petroleum Co. shares ceased trading on the New York Stock Exchange at the close of business Monday and the company's name changed to Berry Petroleum LLC. LINN-Berry merger map. Note that Berry's Placerita operations, compared to its San Joaquin holdings, aren't big enough to show up on the map. Source: LINN Energy. Click image to enlarge. Berry operates (and through Monday, owned) the 65-year-old Placerita oil field off of Sierra Highway in Newhall and substantially larger oil and natural gas properties in Kern County, Utah, Colorado and West Texas. The merger deal was initially announced in February and was supposed to close June 30, but it got sidetracked when the Securities and Exchange Commission launched an informal inquiry into LINN's hedging strategy. LINN's share price fell as a result, and by summer, the 1.25 shares of LinnCo that were to be traded for each share of Berry weren't worth as much. So LINN sweetened the pot and upped the offer to 1.68 shares in November, when the SEC inquiry apparently ended. About LinnCo. Source: LINN Energy. Click image to enlarge. LINN is a limited liability company (LLC) that makes &distributions& of income. 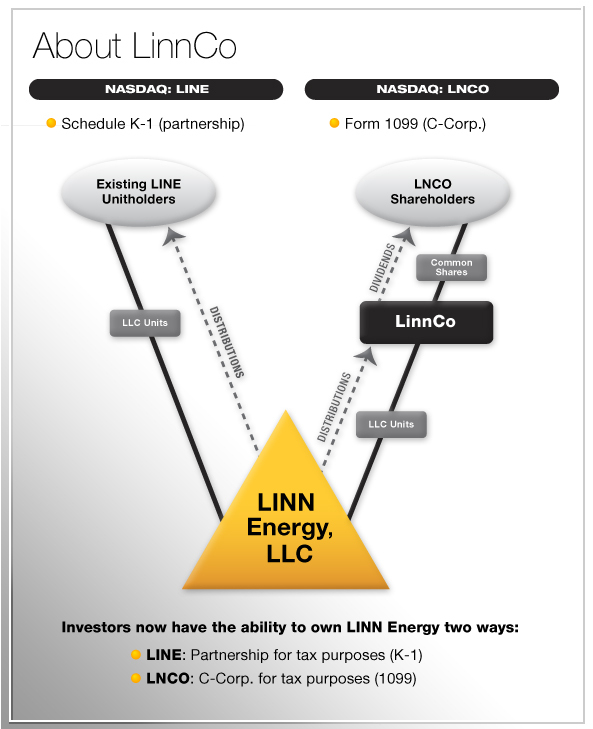 LinnCo is a C-corp whose sole function is to own shares of LINN and pay &dividends.& (They have different tax implications; one is treated as capital gains at the time of disbursement and the other isn't.) Both trade on the NASDAQ stock exchange. Monday's investor reaction to the merger was tepid. LINN share prices actually fell a bit and analysts said the company overpaid in the end, although they've been generally impressed with Berry's own performance as it ramped up production over the past year. Berry was a holdover from the old days of oil production, having started in 1909 in Taft and drilling for more than a century in the Midway-Sunset field. Berry became a publicly traded company in 1987 and started looking outside of the San Joaquin Valley. 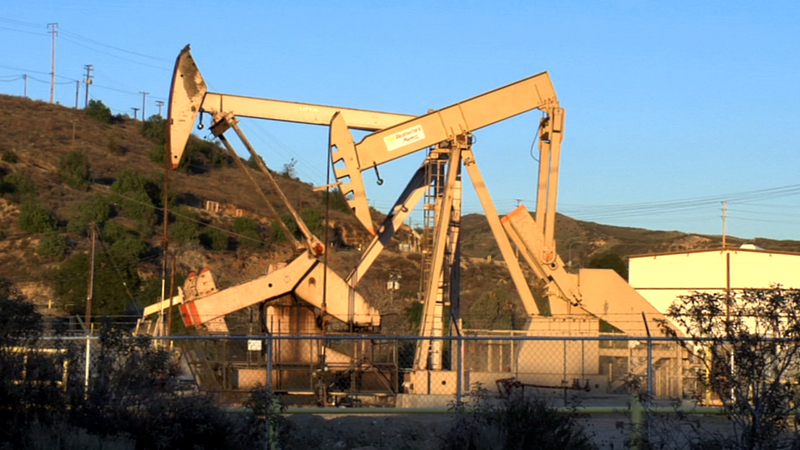 It bought the roughly 700-acre Placerita oil field in 1999 from Aera Energy LLC, a venture of Shell and ExxonMobil. The active part of the Placerita field has been under development since 1948, when it was known as Confusion Hill for its crazy quilt of often conflicting oil claims. It has been good for about 2,300 barrels per day of oil and natural gas equivalent in recent years. Berry started expanding outside of California in 2003 and moved its corporate headquarters to Denver. At last count, it had 2,850 producing wells and owned more than 200,000 net acres in four states. Berry had been boosting its oil production all year. Overall, it brought 41,413 daily barrels of oil and natural gas to market during the third quarter of 2013, a 14 percent increase over the same period in 2012. Within California, Berry drilled 18 new oil wells in 3Q 2003, including nine at Placerita. LINN is a new-style energy company founded in 2003 with a handful of natural gas wells. It went public in 2006 and turned its attention to buying &long-life properties that compliment its asset profile& in the richest oil regions within the United States (Berry operates in many of the same areas). Prior to the Berry buyout, LINN had 1,100 employees in a dozen locations across the country and proved reserves of 4.6 trillion cubic feet equivalent (Tcfe) of oil and natural gas. 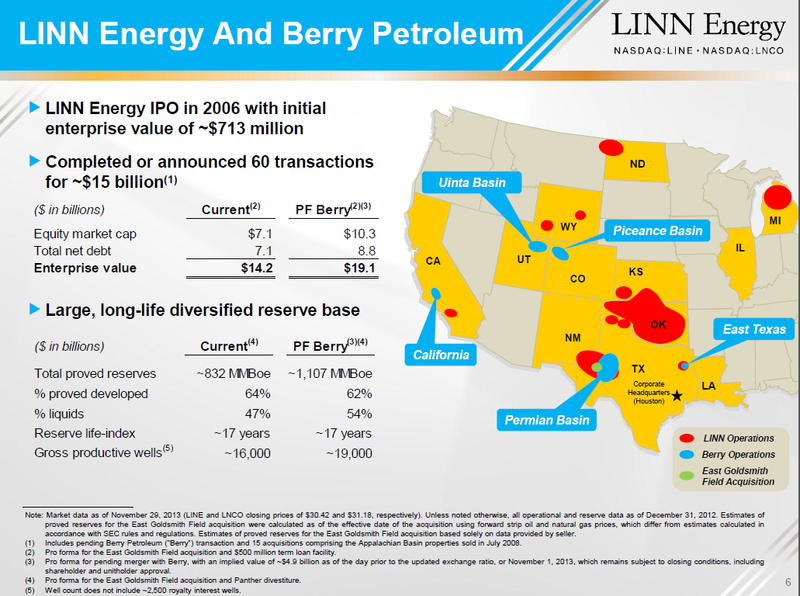 LINN grows by roughly 33 percent with the Berry takeover; Berry adds 1.65 Tcfe to the portfolio and boosts LINN's overall ratio of liquids to 54 percent (from 47 percent). LINN estimates that Berry has possible and probable reserves of another 3.8 Tcfe. On February 12, 1999, Berry Petroleum Company, a Delaware corporation (the "Company"), purchased certain assets, known as the Placerita oilfield, from Aera Energy, LLC for the aggregate consideration of $35 million (net of operations from December 31, 1998). The consideration was paid for by borrowing from the Company's unsecured credit facility. The Company has been operating the oilfield since December 31, 1998. The Placerita oilfield is comprised of six leases (three are federal leases) and two fee properties totaling approximately 700 acres, which are currently producing approximately 2,800 net barrels per day of 13 degree gravity crude oil from 120 producing wells and 56 continuous steam injectors. Berry estimates the proved reserves at approximately 20 million barrels of which 65% are developed. The acquisition also includes a 42 megawatt cogeneration facility which generates electricity and which provides approximately 13,500 barrels of steam per day for injection into the oil reservoir. This cogeneration facility has two Standard Offer 2 electrical sales contracts with a major utility, one of which expires in 2002 and one in 2010. [Click here] for Berry's complete filing, including the purchase agreement, well information and more. Berry Petroleum Co., the Denver-based owner of the Placerita oil field on Sierra Highway  with much bigger petroleum operations in Kern County, Utah, West Texas and Colorado  is being bought by an affiliate of Houston-based Linn Energy, one of the nation's top 15 oil and natural gas companies. The all-stock transaction is valued at about $2.5 billion, or $4.3 billion with assumed debt. Berry filed paperwork with the Securities and Exchange Commission on Thursday showing that its stockholders would receive 1.25 shares in LinnCo for each Berry share. That equates to $46.2375, or 19.8 percent more than Berry's closing price on Wednesday. The company's share prices jumped by roughly that amount Thursday to make up the difference. "Today's merger announcement with Linn Energy marks the beginning of a new, important chapter in our company's history," Berry CEO Robert Heinemann said in a statement. "Berry's portfolio fits well with Linn's structure and asset base, and the combination of the two companies will create one of the largest independent E&P companies in North America." "We have great respect for what the Berry management team has accomplished," Linn CEO Mark E. Ellis said, "and (we) consider the Berry employees to be an important part of this transaction. We welcome them to Linn and believe that together, we will be positioned for great success in the future." The transaction was approved by both companies' boards of directors and still awaits shareholder approval. The deal should close before June 30. Linn has about 4.8 trillion cubic feet of natural gas equivalent. By comparison, Berry's proved reserves include 534 billion cubic feet of natural gas and 186 million barrels of liquids (for a combined total of 275 million barrels of oil equivalent). Berry traces its roots to the San Joaquin basin in 1909. It became a publicly traded company in 1987. It bought the Placerita oil field in 1999 from Aera Energy LLC, a San Joaquin Valley oil and gas company jointly owned by affiliates of Shell and ExxonMobil. The active portion of the Placerita field (northwest of Sierra Highway between Placerita Canyon Road and Golden Valley Road) dates to 1948 when it was known as Confusion Hill during a period of competing and conflicting oil claims. Historic pumping in the broader Placerita Canyon region dates to 1899. In 2011, Berry started flooding older wells on its Placerita property with steam in order to boost production to 2,300 barrels per day. 1. When it bought the Placerita property in 1999, Berry was headquartered at 28700 Hovey Hills Road, P.O. Bin X, Taft, Calif., 93268.